Use the same ad to make flyers and start passing these flyers out on cars, at daycare’s the first week of school, neighborhoods, businesses where parents shop for back to school, and at your promotional booths. By using the same Back to School ad you will better gain the use of visual frequency thus giving you a better result for your campaign. Email all prospects and ex-students your schools newsletter or a back to school special. Use your Back to School window ad. Have a huge banner made into a sign that says “Back to School Classes Now Forming”! Hang this over your door outside your school or somewhere visible. www.MartialArtsMarketing.com has these available at very reasonable pricing. Find when your local schools are having office days or in-service days for the teachers. Visit schools secretary and offer to buy doughnuts, muffins, bagels, and coffee for all the teachers’ breakfast or pizza for their lunches. When you deliver the goodies, bring any promotional materials to give to the teachers, like coffee cups with your logo filled with candy, pencils with your logo, and magnetic school calendars. Ask the secretary when their parent open house is and ask for permission to set up a promotional table. Also ask the secretary to give you any information on PTA, its president, organizers and meeting times for you to follow up on latter. Ask the secretary who is in charge of school newspaper and inquire about running display ads with them and also ask them to run an article that you have written about: child safety, self defense, history of the martial arts, benefits of martial training for children, or any subject that you are an expert on. While at the school find the PE instructors and approach them with the offer to be a guest instructor. Be sure to give them a copy of a school talk presentation sample or hand them following letter with the link to watch the presentation sample to help with their decision and give you a reason to contact them again latter. My name is Barry Van Over, owner and instructor of Premier Martial Arts here in West Knoxville. I would like to offer my services to be your Special Guest PE Instructor for your classes. I will instruct an awesome workshop called “Karate for Concentration” to all the students in your school during their PE classes or in assemblies. This workshop teaches the students the importance of Focus, Confidence, and Goal Setting. This program has been provided to elementary schools all across the country and right here in Knoxville for many years. We use fun martial arts analogies to teach these important personal development concepts and show the students how to apply them within their school work. 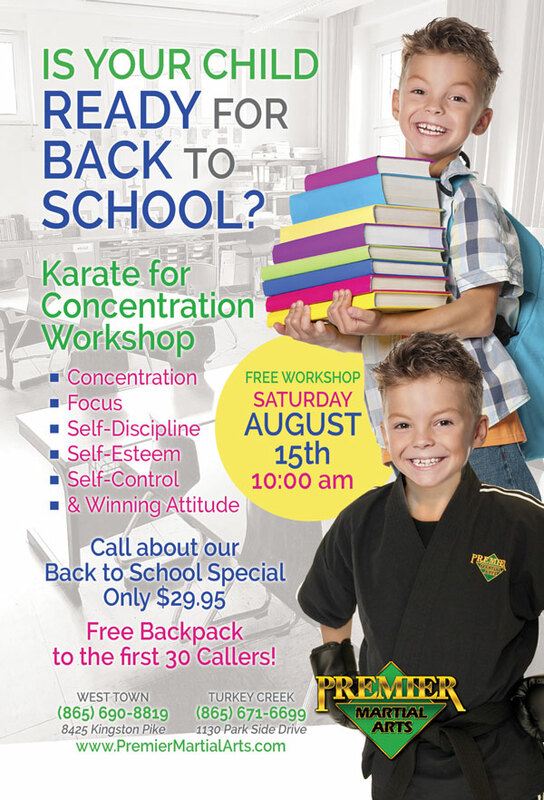 You can go to this website and quickly see a few clips of an actual “Kid Safe” and “Karate for Concentration” workshop being taught to a group students at their elementary school. This workshop is a safe, exciting, and motivating presentation that affirms many of the behaviors that your teachers and parents want from their students. This workshop is non-aggressive, non-violent, and no contact is made between students at all. This is a personal development – motivational presentation for kids through the concepts of martial arts. We also offer the workshops of KID SAFE, BULLY PROOF, KID FIT, The ABC’s Of Success, and Leadership Development. More good news is that we are supported by the national non-profit organization “Premier KIDZ Foundation”, so there is absolutely NO COST to your school for our presentations. We are currently scheduling our workshops for the 2012 -2013 school year. If you are interested in scheduling us to visit contact us at your earliest convenience.